Today’s tech topic is how to change windows 10 start menu look like windows 7. Such people who have windows 10 OS but they do not like look of its start menu, they like windows 7 look. In this condition, they can change 10 look similar to 7. 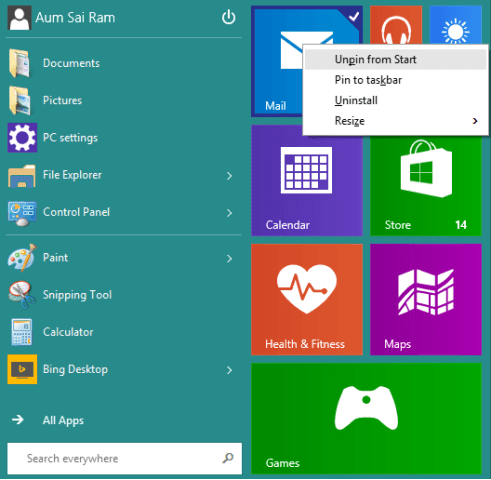 All of us know that, windows 10 start menu contain app tiles and windows 7 do not. So, easily remove apps tile, after that its look will be like windows 7. Its simple process is mentioned under. -> Press right button of mouse on Apps tiles, a popup menu will appear, select Unpin from start. -> Repeat above steps till all tiles do not remove. -> When all tiles will be removed then its look will be like windows 7 start menu.